1999 JAG Young Sarah MacKenzie Episode: "Second Sight"
2002 Presidio Med Tara Wegman Episode: "Good Question"
2003 Without a Trace Siobhan Arintero Episode: "Maple Street"
2003 Boomtown Denise Stein Episode: "Home Invasion"
2006 Veronica Mars Stacy Wells Episode: "The Rapes of Graff"
2010 The League April Episode: "The Expert Witness"
2013 NTSF:SD:SUV:: Gail Episode: "Burn After Killing"
2014 Drunk History Frances Cleveland Episode: "First Ladies"
2014 Robot Chicken Minerva McGonagall (voice) Episode: "G.I. Jogurt"
2015 Adventure Time Betsy Poundcake (voice) Episode: "The Diary"
2015 Broad City Adele Episode: "Coat Check"
2015 Drunk History Virginia Hall Episode: "Spies"
2016 Portlandia Mayor's Kid Episode: "Shville"
2016 Animals. Sharon (voice) Episode: "Rats." 2016 Drunk History Alexander Hamilton Episode: "Hamilton"
2017 Big Mouth Roland (voice) Episode: "Pillow Talk"
↑ Alliance For Women In Media Foundation Announce The 2017 Gracie Awards Winners (en). آرشیولنیب اصلی نۆسخه‌دن on 13 April 2017. یوْخلانیلیب12 April 2017. 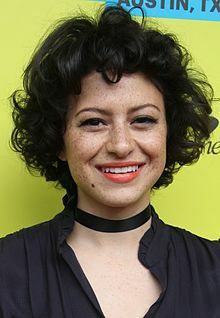 اینگیلیسجه ویکی‌پدیاسی‌نین ایشلدنلری طرفیندن یارانمیش«Alia Shawkat»، مقاله‌سیندن گؤتورولوبدور. ( ۲۱ دسامبر ۲۰۱۷ تاریخینده یوْخلانیلیبدیر). قارداش پروژه‌لرده عالیه شوکت گؤره داها آرتیق بیلگی‌لر تاپابیلرسینیز.